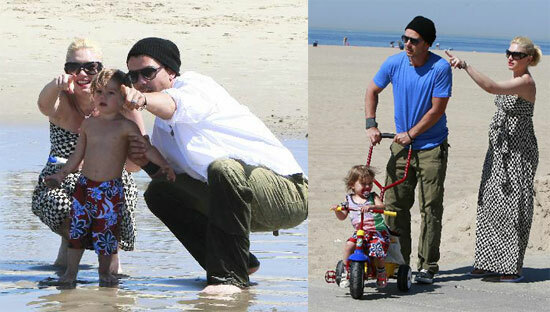 Gwen and Gavin made a beach bum out of Kingston in Santa Monica on Saturday. After a ride around on his bike, Kingston hit the sand with his parents, and even braved the cold water in his adorable swim trunks. Gavin proved that he wasn't afraid to get his pants wet and splash around also. They ended their day with a popsicle to cool down, so all in all it looks like a perfect day soaking up the sun. Maybe in a few years Kingston will even get to ride that roller coaster up on the pier. All these outings seem so staged. Just like Violets outings with Jen did. I mean, who wears a beanie, long sleeve top and pants to the freakin beach? It's funny that the same thought occured to me about their last outing as well... perhaps they're not staged, but they certainly must know that if they are in LA and going to the beach that they will be photographed... so it's probably more like they have a grudging acceptance of the fact that they're gonna get photographed so make the best of it.